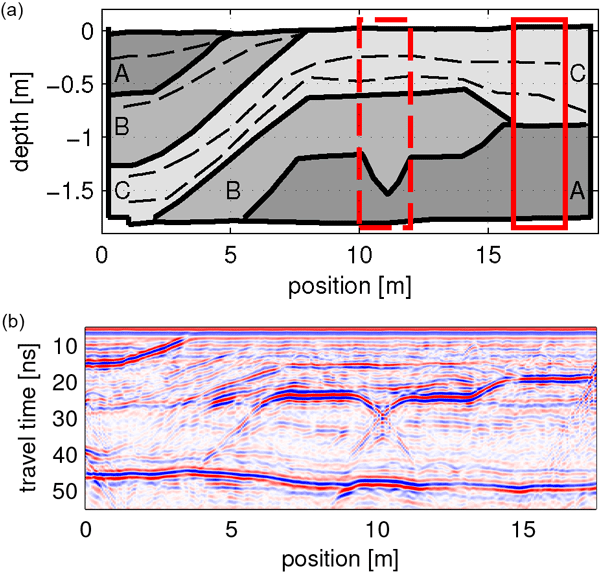 In this study, we analyze a set of high-resolution, surface-based, 2-D ground-penetrating radar (GPR) observations of artificially induced subsurface water dynamics. In particular, we place close scrutiny on the evolution of the capillary fringe in a highly dynamic regime with surface-based time-lapse GPR. We thoroughly explain all observed phenomena based on theoretical soil physical considerations and numerical simulations of both subsurface water flow and the expected GPR response. Stream, soil and precipitation waters were collected in a tropical montane cloud forest catchment for 2 years and analyzed for stable water isotopes in order to infer transit time distribution functions and mean transit times for semi-steady-state conditions. Samples were aggregated to diverse sampling resolutions for checking the sensitivity of sampling frequency on lumped-model predictions. Results provide valuable information for the planning of future fieldwork in similar catchments. We present tools to assess shifts in the distributional properties of continuous environmental variables and to identify potentially anomalous years. We demonstrate the utility of these tools using stream temperature as an illustrative example. We were able to examine seasonal and annual responses to climate and other human-related influences. These tools will be useful to characterize how regimes of continuous phenomena have changed in the past, or may respond in the future. This paper explains the different natural modes of interannual variability in the flow of the Nile River and also presents a new index based on the sea surface temperature (SST) over the southern Indian Ocean to forecast the flow of the Nile River. It also presents a new hybrid forecasting algorithm that can be used to predict the Nile flow based on indices of the SST in the eastern Pacific and southern Indian oceans. Several methods for measuring unsaturated soil characteristics have been tested on sandy soil in northeastern Thailand, with different land uses. Each method shows significantly different parameters, regardless of land use. Nevertheless, when used for annual water balance modeling with HYDRUS1D, no noticeable differences for the various sets of parameters appeared. Any of these measurement method could be employed. Therefore, we recommended using the cheapest and easiest (i.e., Beerkan) method. This study follows organic carbon from soils along sediment flow paths at catchment scale to analyse the evolution of OC pools. Selectivity of particles during detachment and transport, and protection of OC during transport and deposition are key for the concentration and quality of OC at depositional settings and for the terrestrial carbon sink. OC can also be increased by ecological processes and by replacement in eroded areas, converting catchments into relevant sinks for C budget. An iterative isotope mass balance approach was used to quantify the groundwater dependence of 67 kettle lakes and ponds. A quantitative measure for the dependence of a lake on groundwater (G index) introduced in this study revealed generally large groundwater dependency among the lakes. The isotope mass balance approach proved to be especially useful when the groundwater reliance of lakes situated in a relatively small area with similar climatic conditions needs to be determined. Socioeconomic and hydro-climatic data were used to model water resources, water demand and their interactions in two river basins. By using an integrative framework we successfully modeled variations in water stress over the past 40 years, accounting for climate and human pressures and changes in water management strategies over time. We explained past changes in discharge by separating human and hydro-climatic trends. This work will help assess future water stress and design adaptation plans. The crystalline rock aquifers of the Armorican Massif present clear evidence of a marine origin of the saline component in the fluids on the regional scale. High chloride concentrations are attributed to three past marine transgressions. The relationship between chloride concentration and transgression age provides constraints for the timescales of fluid circulation. This time frame is useful information for developing conceptual models of the paleo-functioning of Armorican aquifers. Soil moisture was observed along a strong semi-arid climatic gradient in a Mediterranean karst area. Soil moisture data and soil hydraulic modelling with Hydrus-1D revealed a strong dependency of percolation fluxes with rainfall amounts and intensity during heavy rainfall events. Spatial and temporal extrapolation of the model illustrated the high variability of seasonal percolation amounts among single years and showed strong correlations between soil depth and potential groundwater recharge. As water resources are increasingly used for various purposes, there is a need for a unified framework to describe, quantify and classify water use in a region, be it a catchment, a river basin or a country. This paper presents a novel water accounting framework whereby the contribution of traditional water uses but also storage services are properly considered. From 2007 to 2009, northern Iraq suffered a severe drought and GRACE satellite observations indicate a water loss of about 146mm equivalent water height (EWH) in the same period. To identify the main causes of this water loss, we developed a model based on geology, remote sensing and stream flow data. Our findings indicate that anthropogenic groundwater extraction has a minor influence in this region, while a decline in lake mass and natural depletion of groundwater play a key role. The paper introduces a high resolution precipitation analysis system which operates on 1 km x 1 km resolution with high frequency updates of 5 minutes. The ability of such a system to adequately assess the convective precipitation distribution is evaluated by means of an independant, high resolution station network. This dense station network allows for a thorough evaluation of the analyses under different convective situations and of the representativeness error of raingaue measurements. The aim of the paper is the application of the KULTURisk regional risk assessment (KR-RRA) methodology, presented in the companion paper (Part 1), to the Sihl River basin, in northern Switzerland. Flood-related risks have been assessed for different receptors lying in the Sihl river valley including the city of Zurich, which represents a typical case of river flooding in an urban area, by means of a calibration process of the methodology to the site-specific context and features.